Director Robert Zemeckis used Panavision's System 65 for several scenes and background plates in his latest film “Contact”. “…practicality also led to the use of the 65mm format, since its larger size negative greatly lessens any image degradation caused through effects work”. The film will be distributed in 35mm anamorphic prints. 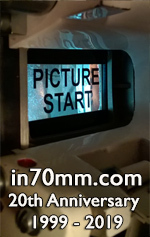 There are no reports about 70mm prints.